"We have a great story to tell industry: a growing pipeline of discoveries, and the right people and platforms for collaboration." We look forward to working with you as a partner to turn our discoveries into the next generation of therapeutics, diagnostics and devices. Monash University is in pole position to accelerate the commercialisation of our breakthroughs globally. Its long track record of commercialising technology and discoveries to bring new products and services to the market includes the world-famous Monash IVF and flu treatment Relenza™. 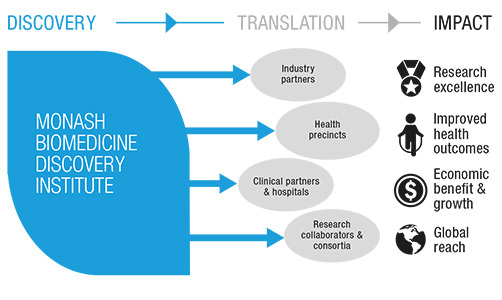 At the Monash Biomedicine Discovery Institute, we’re working with leading pharmaceutical and biotechnology companies to develop our discoveries, with close to 20 potential therapies in the pipeline. We want our research to deliver even greater benefits to society and solve unmet medical needs. To that end, we have already partnered some of our most promising research with leading biotechnology companies such as Regeneron, Janssen, Roche, GSK, as well as Pfizer CTI. Monash’s state-of-the-art integrated platform technologies has also attract local small and medium enterprises, such as Trajan and MiniFab and international corporations like CSL, Tecan, MedImmune and others. We encourage you to get in touch with us to find out how we can work together. Authorised by: Chief Marketing Officer, Strategic Marketing and Communications. Maintained by: FMNHS Web Team. Last updated: Feb 2019.